There are no photos with those IDs or post 15822 does not have any attached images! 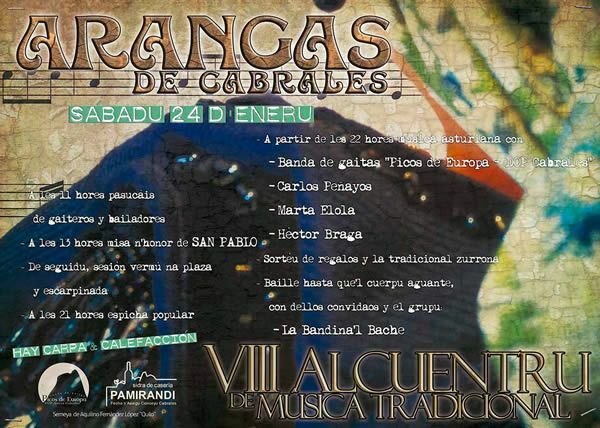 On 24 Saturday in January the 8ª edition of the traditional music gatherings of Arangas de Cabrales takes place. An unmissable event for lovers of this music. At the 11 parade hours of pipers and dancers. At the 13 mine hours in honor of San Pablo. After vermouth session in the square and tent. At 21 hours, it's popular. Giveaway of gifts and the traditional zurrona. Dance until the body endures with the group La Bandina'l Bache. They have tent and heating, so the cold does not serve as an excuse to get close to Cabrales.